Are smoke detectors mandatory in my (rented) home? Are smoke detectors the responsibility of the tenant or landlord? Which and how many detectors do I need? Are the smoke detectors in accordance with NBN EN 14604? Are smoke alarms mandatory for B&Bs or hotels? According to statistics, the installation of fire detectors reduces the risk of a fatal fire by as much as 70%. Installing fire alarms is therefore an essential basic necessity in order to make your home safe. On this page you can find some general tips about the number and type of smoke detectors you can install. There are different types of fire detectors: smoke detectors, heat detectors and CO detectors. Each one has its own distinct function. Smoke detectors only detect smoke itself: by means of an optical measuring system, the detector continuously registers whether and how many smoke particles are in the air. If there are too many, the detector will sound an alarm. Since smoke always rises, it is important to hang a smoke alarms as high as possible, preferably on the ceiling. Only if you have a pyramidal roof, you should install the detector 30cm lower than the ridge of the roof because stagnant air can prevent smoke from rising. Heat detectors do not detect smoke, but continuously measure the temperature of the room. They sound an alarm if the temperature exceeds a certain limit. Heat detectors are very useful in places where smoke detectors would give too many false alarms, especially in places where a lot of (water) vapor or other gases may be present, such as in the kitchen, bathroom and garage. CO detectors continuously measure the amount of carbon monoxide, or CO, in the room. Carbon monoxide is a very dangerous gas. It spreads evenly through the air if it doesn't burn up properly and there's not enough oxygen to form CO2. It's odourless and invisible. CO detectors are therefore essential in homes that are heated by a combustion boiler. Gas detectors do not detect carbon monoxide, but they do detect other gases. They measure the presence of natural gas, butane, propane and LPG. Depending on the type of gas you want to detected, you can place the detector low to the ground (butane and propane) or close to the ceiling (natural gas and LPG). How many and what kind of detectors do I need? It's recommended to install at least one smoke detector per floor. It is best to install the smoke alarm on the escape route, which is usually the hall. That, however, is the absolute minimum. If you want to improve your security, it is recommended that you also install a smoke detector in the bedrooms and, by extension, the living room. For the kitchen and garage, opt for heat detectors to avoid false alarms. See the article "Where to Install Smoke Alarms?" for more information about the placement of Smoke Alarms. CO detectors are recommended in houses where the heating is based on combustion. It is best to install a CO detector in the hall of the bedrooms, not too close to the boiler itself to avoid false alarms. If necessary, you can place extra CO detectors in the bedrooms themselves. Be sure to place enough CO detectors if each bedroom has a separate combustion unit! Check out the article "Where to place CO detectors?" for more information about the placement of CO detectors. Do you use gas for heating or cooking? Then a gas detector is recommended. It is best to install a gas detector in every room where gas-consuming appliances are installed. 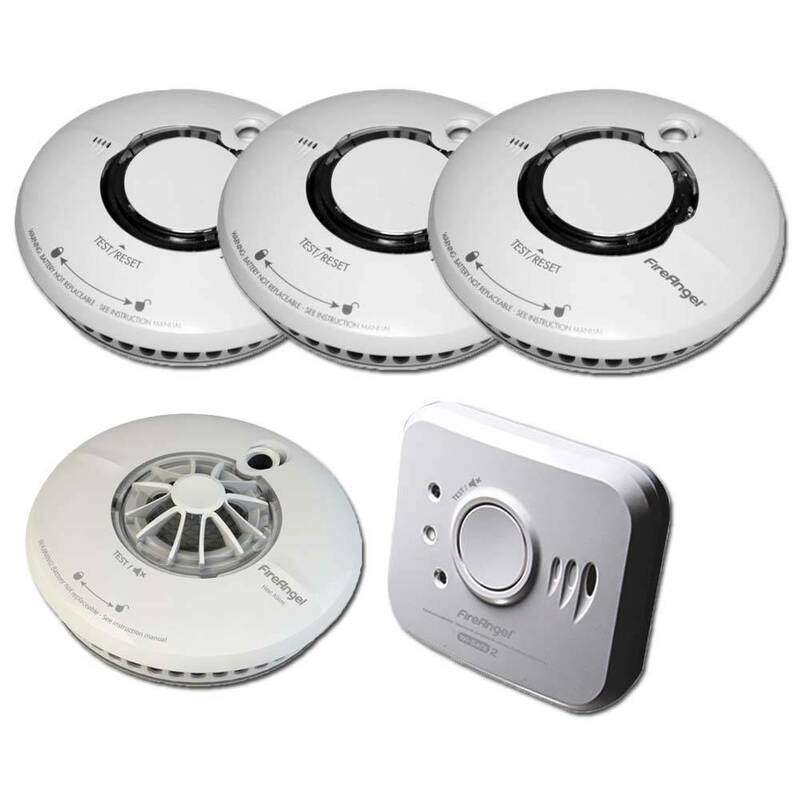 Wireless detectors: these are detectors (smoke detectors, and in some systems also heat and CO detectors) that all give a signal if one of the detectors in the system detects danger. If one alarm goes off, all alarms go off. These are often slightly more expensive systems, but they have the clear advantage that you will always hear a loud alarm. Non-wireless detectors: these are autonomous detectors, each device gives its own alarm signal. These detectors are a bit cheaper than wireless detectors. First of all, decide whether it makes sense to go for a wireless alarm system or not. It might come in handy in in larger locations and in apartment buildings, where the alarm from a single detector may not be heard on the other side of the building. A single detector traditionally has an alarm signal of 85db. This is loud enough to bridge a floor. 9 volt battery detectors: these are the standard smoke detectors and usually the cheapest. The battery needs to be replaced once a year. AA battery detector: an intermediate model. The batteries need to be replaced approximately every three years. Lithium battery detectors: the crème de la crème. The batteries never need to be replaced; they will last for 10 years. 230 V detectors: these are smoke detectors that you connect to the electric supply and that do not operate on batteries. They do have a backup battery, which will keep the detector running in the event of a power failure. After ten years, you should always completely replace a detector (this may need to happen faster in the case of CO and gas detectors; always check the manufacturer's instructions). This way, the reliability of the sensor is guaranteed. It's best to buy detectors with a longer battery life. This way, you avoid forgetting to replace the battery and annoying battery replacement signals from the detector when the battery needs to be replaced. If your budget does not allow this, opt for detectors with a shorter battery life, but try to arrange a fixed moment to replace the batteries (e.g. at the beginning of winter). What are the best selling models? The Alecto wireless smoke detector with 9V battery for the detector itself and AA batteries for the coupling system. An affordable system of detectors that comes with three detectors. Now with free magnetic mounting kits! The Fire Angel Wi-Safe 2 system containing smoke, heat and CO detectors with lithium batteries that you don't need to replace. This system is more expensive to buy, but offers you a complete protection. The First Alert Smoke Alarm with 10-year-old lithium battery is a classic that lets you sleep soundly. Now with free magnetic mounting kit! The Fire Angel Thermoptek Smoke Alarm with 10-year-old lithium battery is our top smoke detector, with additional built-in heat sensor to avoid false alarms as much as possible and to sound alarms faster in case of a slow smouldering fire. Now with free magnetic mounting kit! The Fire Angel Thermistek heat detector with 10-year lithium battery is the showpiece of the heat detectors, with a differential thermometer that continuously measures temperature changes. The Fire Angel CO detector with 10-year lithium battery has a long-life sensor and battery so you can sleep soundly. Do I have to drill into the ceiling to install a detector? All detectors are delivered with a wall mounting system that you have to drill into the wall or ceiling. Don't want to drill? Then use a magnetic mounting kit. It consists of two magnetic plates: one is pasted on the detector, the other on the ceiling. This way, your detector remains magnetically suspended and you don't have to drill. The ceiling plate can be removed if you want to move the detector.